What’s up with the pineapple? 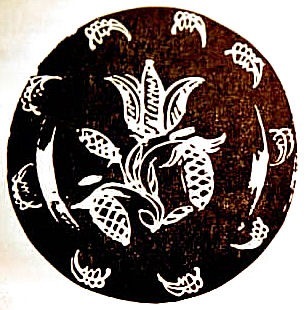 The 18th century intelligentsia would have quickly read the intended meaning behind the pineapple image. They were well versed both in the language of classical symbolism and the art of social gatherings. Federalist and Georgian decorative arts, and Neoclassicism in general, was positively replete with arcane symbolically coded messages. These messages were mixed and matched to create a variety of commentary to fit whatever occasion presented itself. The pineapple was rarely if ever seen on English or North American dinner tables until refrigeration and steam powered transportation made access to it practical. Pineapples were so rare, in fact, that nobody at the time associated them with anything other than the expensive quirks of the host. The first recorded reference to the pineapple as a hospitality symbol was in a 1935 promotional booklet about traveling to Hawaii. What is described today, and reproduced by many in the traditional arts scene, as a pineapple was in fact a pinecone. 18th century socialites well understood the pinecone as a classical symbol of fertility and regeneration. In classical Greek mythology, Dionysus the God of Wine held a pinecone topped staff – classical wine making required pine resin. The famous Dionysian rites were a frolicking romp of fertility and regeneration. It’s one reason why holiday wreaths often include pinecones instead of pineapples. Some allowance can be made for mistaking the 18th century pinecone for a pineapple. When the English first encountered the fruit they visually associated it with the pinecone by calling it a “pine-apple.” But only a little allowance can be made. When the classical cannon of symbolism was established nobody in Europe had any idea what a pineapple was. Colonial Williamsburg Journal. Stuff and Nonsense. Winter 2008. You are currently browsing the This Day in Pottery History blog archives for December, 2014.